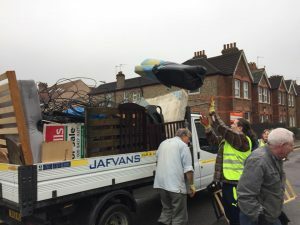 Residents cleared 4.9 tonnes of junk and rubbish at HCRA’s annual Dump Run, helping keep our homes, streets and alleyways tidy. The event on Saturday, March 24, saw a team of neighbours volunteer their time for the community clean-up. HCRA hired a tipper truck to ferry unwanted items, including old fridges, sofas, and mattresses to the town dump. The event, which is supported by Harrow Council, also saw green-fingered locals weed tree pits and tidy the community garden outside the Nisa convenience store. Yet again the team had to clear piles of rubbish from the passage that runs between homes in Rosslyn Crescent and Woodlands Road, due to fly-tipping. HCRA is urging those whose homes back onto the passage not to chuck garden waste and rubbish over their fences. The Dump Run is a free event but HCRA collects donations towards the hire of the truck and other expenses. This entry was posted in Posts by Jo. Bookmark the permalink.